Added an estimated delivery date throughout the purchasing journey to increase buyer confidence. Also built a seller tool that empowers sellers to give buyers an estimated delivery date. The team of 1 Product Manager, 1 Engineering Manager, 3 Engineers. Collaborated with Copywriters, UX Researchers, Legal and Policy team, and Product Marketing manager. The most significant buyer pain points when shopping on Etsy has been not being able to know delivery date estimation. Unlike other mass production e-commerce site, Etsy sellers ship handmade goods from their local post office, and it takes few days to as long as ten weeks to create their orders before shipping them out. 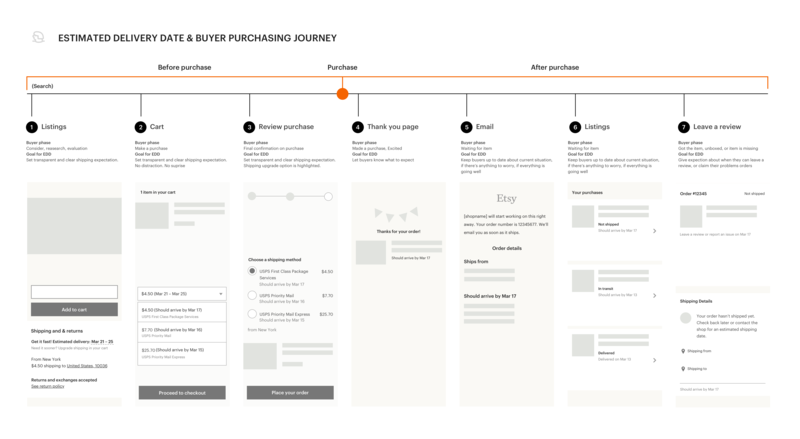 This combination of different processing time and delivery method on top of buyer location all around the world made it challenging for Etsy to give a precise delivery date expectations to buyers. Unknown delivery dates also generated an additional back and forth communications between sellers and buyers. One of the risks of showing estimated delivery date was a decrease in purchase rate due to clarifying slow delivery date. We did competitive research, data analysis, and discovery research to understand what are the buyers and sellers expectations. 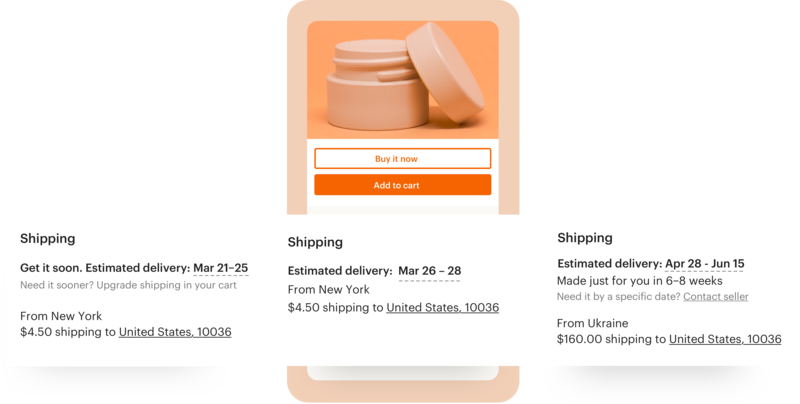 Our hypothesis was that even if we see conversion loss in the short term, having transparent shipping information will result in higher buyer satisfaction and more repeat purchases in the long-term. After intense copy iterations, we ran an A/B testing and verified that showing estimated delivery date doesn't negatively affect the purchasing decision. Based on this result, we moved on to build a tool that will enable every seller to let their buyers know estimated delivery dates easily. Most of the orders were delivered within the estimated delivery date. Conversion rate was neutral, which was a win considering slower delivery time compared to industry standard. Buyer sentiment has been improved significantly. Seller reaction was divided. There were the group of sellers who liked being able to easily show estimated delivery date, while some people were scared of getting bad reviews when orders didn’t meet the expected delivery date due to shipping carriers fault, which is outside of their control. The outcome was a single line of copy. However, the design process and engineering and data analysis effort that took into this project were much more complicated. Etsy sellers ship their items from and to nearly every country in the world, and there are lots of different delivery options. There were also lots of legal issues about predicting seller’s delivery date which is out of Etsy’s control and had to address lots of sellers concerns. Working on the product that spans across entire buyer journey meant collaborating and adjusting opinions with multiple teams. Buyer–Copy should be simple, consistent, and work with translations. Seller–Accuracy is the key. Provide structured data to eliminate any chance of mistake rather than allowing free forms. Created a segmentaion map based on delivery duration and processing time and went through copy iterations with copywriters, legal and policy team. We ran a quick A/B testing to validate the value of estimated delivery date before investing in time and effort to build seller tools. The visible result of 2 months of a project can be a single line of copy, but it’s more about how we arrived at a specific user experience. Moving first step forward on a challenging and sensitive topic requires lots of effort, but it becomes a stepping stone for next iterations.